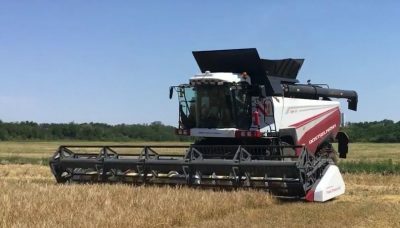 RUSSIA has stepped into the world of automated machinery with a Russian company field testing an autonomous grain harvester. The Rostselmash RSM 181 Torum automated harvester under field test in a crop of barley in southern Russia. Cognitive Technologies, which develops robotic systems and software for machine vision, has field tested a Rostselmash RSM 181 Torum harvester in the Rostov region of Southern Russia. Company president, Olga Uskova, said the company had spent more than five years developing the system and expected to have a fully autonomous grain harvester available for commercial release by 2023-2024. She said the system was low-cost because it used a single video camera as a sensor, unlike other systems that used laser scanners, stereo cameras, lidars (light detection and ranging), etc. “The automated complex of our smart harvester includes a video camera and artificial intelligence system,” she said. 5) All other objects – obstacles, other machinery, forests, trees, roads, weeds, people etc. Mrs Uskova said in the field tests, instead of the planned field of wheat that would have been more than 80 centimetres high, farmers provided fields of barley that were about 30cm high. “This was a great, almost impossible challenge. For 1.5 days we retrained the neural network based on the datasets of other agro cultures. As a result, the neural network was able to determine the stacked roll and the field scene better than the person. The result surpassed all expectations. This is a breakthrough,” she said.